Empowering you to create spectacular multi-camera live productions in a wide range of formats including SD, HD and Ultra HD standards, the Blackmagic Design ATEM 1 M/E Production Studio 4K is the Ultra HD 4K production switcher. 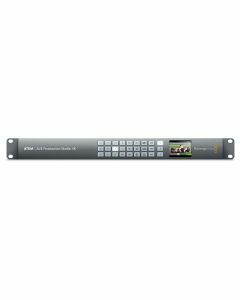 The ATEM 1 M/E includes DVE, stingers and 6G-SDI as well as being a portable solution, making it a solid, adaptable option for location and studio production work. It also features potent tools like chroma key, media pool, multi view, downstream keyers, creative transitions, an audio mixer and much more. The Blackmagic Design ATEM 1 M/E Production Studio 4K is as pleasant to look at as it is functional. Its front panel is made from elegant machined aluminium, with dedicated buttons for switching between auxiliary outputs. The built in video screen can act as technical monitoring to help during set up or to monitor auxiliary output. The optimum video and audio connections switch virtually all SD, 720p HD, 1080i HD, 1080p HD and Ultra HD formats, plus built in multi voltage power supplies so you can take your switcher anywhere. For demanding live production environments it’s possible to add a hardware based ATEM 1 M/E or 2 M/E Broadcast Panel featuring the highest quality buttons, knobs and faders for even faster switching. An SDK for custom control is also available. Only ATEM gives you such a wide range of control options. Full switcher control from any laptop or desktop computer is delivered with the included ATEM software control panel for both Mac and Windows. ATEM Production Studio 4K switchers have an amazing choice of transitions including Cut, Mix, Dip and Wipe patterns. The advanced 1 M/E model also gives you key frame based DVE moves, flying graphics and animated stingers! Every transition is instantly available and you get full control of the transition type, pattern, length and more. With so many creative options you can always find the perfect 'on air' style, so there's no limit to the combination of exciting effects you can create! SDI Video Input: 10 x 10-bit SD/HD/Ultra HD 4K switchable. 2 channel embedded audio. HDMI Video Input: 1 x HDMI type A. 10-bit SD/HD/Ultra HD 4K switchable. 2 channel embedded audio. Analog Audio Output: 2 x XLR. Sync Input: Tri-Sync or Blackburst. Internal Frame Synchronizers: 10. All inputs. SDI Program Output: 2 x 10-bit SD/HD/Ultra HD 4K switchable. SDI Preview Output: 1 x 10-bit SD/HD/Ultra HD 4K switchable. SDI Aux. Output: 3 x 10-bit SD/HD/Ultra HD 4K switchable. Multi View Outputs: 1 x SDI and 1 x HDMI. SD Format Support: 525 59.94i NTSC, 625 50i PAL, 525 59.94i 16:9, 625 50i 16:9. HD Format Support: 720 50p, 720 59.94p 1080 50i, 1080 59.94i, 1080 23.98p, 1080 24p, 1080 25p, 1080 29.97p, 1080 50p, 1080 59.94p. Ultra HD 4K Format Support: 3840x2160 23.98p, 3840x2160 24p, 3840x2160 25p, 3840x2160 29.97p. HDMI Input Resolutions for Computers: 720 x 480i 59.94Hz, 720 x 576i 50Hz, 1280 x 720 59.94Hz, 1280 x 720 50Hz, 1920 x 1080 50Hz, 1920 x 1080 59.94Hz, 3840 x 2160 23.98Hz, 3840 x 2160 24Hz, 3840 x 2160 25Hz, 3840 x 2160 29.97Hz. Control Panel Included: ATEM Software Control Panel included free for Mac OS X 10.7.2 or 10.8 Mountain Lion and Windows 7 64-bit or Windows 8 32-bit or 64-bit. Software Updates: Using USB 2.0 connection directly connected to Mac OS X or Windows computers. Includes ATEM Switcher Utility. Processing Delay: < 2 Lines. Audio Mixer: 12 input x 2 channel mixer. Selectable On/Off/Audio-Follow-Video. Level and Peak metering. Master gain control. Analog outputs may be used for separate monitoring. Control Panel Compatibility: ATEM 1 M/E Broadcast Panel preferred. Compatible with ATEM 2 M/E Broadcast Panel. Includes ATEM Software Control Panel. Front panel: Built in LCD monitor for video and 27 LED buttons for Aux switching. Media Pool Still Image Capacity: 32 with fill and key. Maximum Clip Length in 1080: 720 frames. Maximum Clip Length in 720p: 1600 frames. Maximum Clip Length in NTSC/PAL: 3600 frames.